Here's a new trailer for Capcom's upcoming third-person memory remixing action game, Remember Me. Officially it's called the "Enemies" trailer, but the "Ow, I have a headache now" trailer might be a more fitting name. In it you'll find fast cuts, flashing lights, glitchy effects and some music that I'm tempted to call dubstep, if only to wind up those people that are very passionate about strict genre classifications. 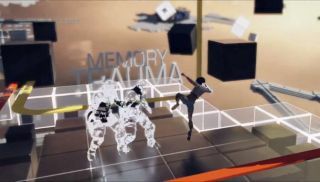 It's a more action-oriented look at the game than previous trailers, which have tended to focus on the Neo-Paris setting, or the weird memory-scrambling puzzle elements. Here we see the variety of enemy types, their abilities, and the combat moves that Nilin deploys to knock the machinery out of them. Remember Me is due out June 4th.